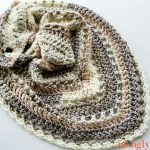 ﻿The Brown Butter Shawl is pretty easy once you get going – it’s just turning the corners that’s tricky! So I’ve put together this video tutorial to get you off to a good start, and walk you through all the middle bits, as well as the edging! Disclaimer: Product support provided by Furls; this post includes affiliate links. And how about some crochet symbol charts? (Please do NOT pin the charts to Pinterest!) Below, you can see a full symbol chart of the first 6 rows on the left, with a chart for the center portion of each row on the right. Remember the repeats – starting with Row 5, the pattern is mesh, solid, solid. And every row begins and ends with 3 dc. But wait, there’s more! Here’s a Pin so you *can* save this tutorial to your favorite Pinterest board! 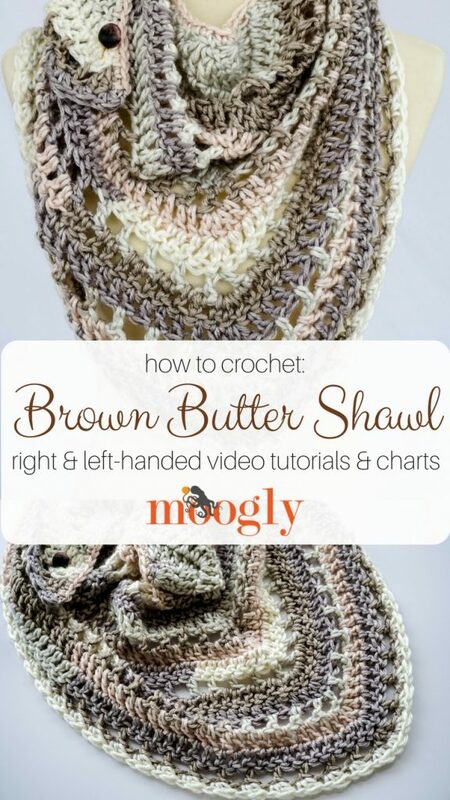 I hope that the videos and chart help you make your own Brown Butter Shawl! There were a few errata in the written pattern, but one of the things I love about making tutorials is that it gives me a chance to catch any errors – and fix them! So everything should be all set now, and ready for crochet success! 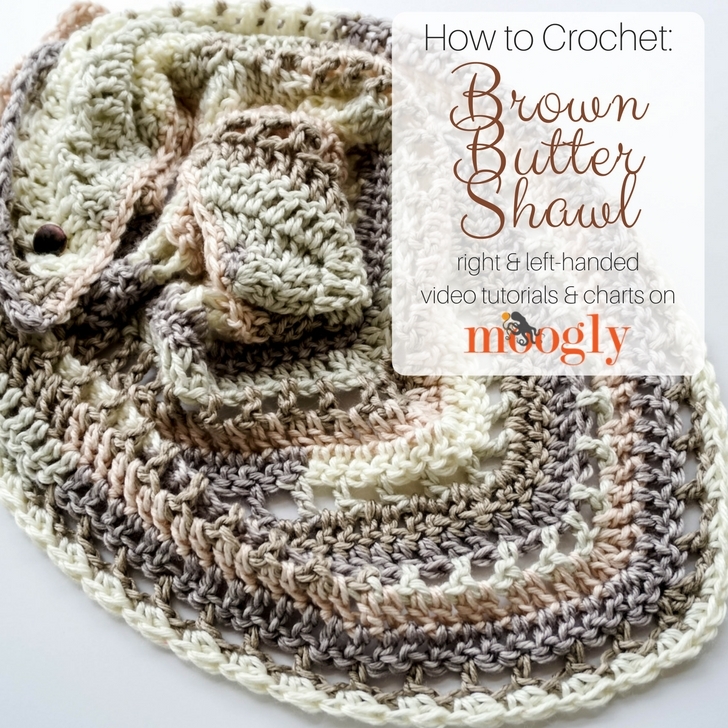 If you decide to make the Brown Butter Shawl and share a photo on social media, be sure to tag me @mooglyblog or #mooglyblog so I can see your lovely creations too! Thanks for reading! Get Moogly on your favorite social media sites: Facebook, Twitter, G+, Pinterest, Instagram & Tumblr! And sign up for the free newsletter at the top of the page so you don’t miss a thing! Thank you to Furls Crochet for providing the materials for this video. I can’t find this yarn anywhere. I get it direct from Redheart.com. This way I am assured to get the color I want. They delivery pretty quickly. Hi I wondering about row eight .. it doesn’t Work out right for me .. maybe I’m not reading it right .. but just before your middle where you put three double crochets in the Center .. should it end up double crochet and skip and chain then three double crochets or it’s it double crochet chain and don’t skip at stitch and then three double crochets in the Center ? Hi Cathy! The center of Row 8 as worked into the center 3 sts of Row 7 is dc in the dc before the marked st, ch 1, 3 dc in the marked st, ch 1, dc in the next st (the st after the marked st). Does that help? 🙂 You can also see this in the chart above. I need some help!!! 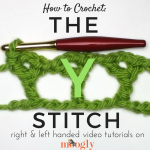 I am not new to crocheting and followed the pattern as posted and I watched the video tutorial. I used a 9 mm crochet hook and Red Heart Essentials yarn , the only difference, I used 2 skeins of solid colors. I’m on row 19 and have only used 2 rows worth of the second skein and at this stage, the shawl looks very small. What did I do wrong. Should I repeat more rows? If yes, which rows? I’m attaching a picture of what I’ve crocheted thus far and as stated, I’m on row 19! Hi Iraida! If you are sure you are using the same yarn – http://www.redheart.com/yarn/soft-essentials-stripes – then it sounds like you might have a tighter gauge than I do – there’s nothing wrong with that, but it can cause issues! Be sure to measure your gauge against the one listed in the pattern. If you do like the fabric but the gauge is off, that’s okay, you can just add more rows to get to the size you need (though it will use extra yarn). Hi, for those of us wanting to use this color..its not isted anywhere. I can go to REDHEART but it doesnt help if I dont know….LOL HELP! I picked it up at Michaels, that might be the best bet! I love your pattern and color choice! The tutorial and chart were very helpful. However this is more like a cowl than a shawl. I’ve been trying to add rows but it needs to be wider as well as longer. Have you tried making a bigger version? Would it work just to follow the same sequence and add 3 more rows? I haven’t myself, but that should work! Love this pattern. I am using a thinner cotton yarn. It will have to be bigger. Should I just repeat the pattern at the end of row 20 until I get the size I want? 😀 I’m so glad you like it, thank you Donna! Hi Tamara , loved the tutorial and made it in very thin yarn …and as Iraida says above I too ended up in a very small cowl like thing….then I looked up the yarn you used and saw it was bulky…so will do one more with bulkier yarn and continue this one with many more rows…Thanks a ton for the beautiful pattern..
I’m so glad you like it! I bet it’s lovely in the thinner yarn too! This is a beautiful pattern. I am having trouble worth done of the rows. Row. 9. Im not getting 57 count. I’ve pulled it out twice. Can you tell me some more info? Are you getting too few, too many? I get 54 and it says 57. Is this the same person as “inkey”? If so, this is in reference to Row 9? Missing 3 is tricky – it’s hard to say where they are getting skipped. Make sure you are counting your ch-3 as a stitch, and not skipping any of the ch sps, in particular the ones on either side of the center point. I wish I could be more help but without being able to sit down with the whole piece, it’s hard to say! Wish I could post a pic of the finished work. The pattern was very simple and it worked up really fast. I used Mandela yarn in Sphinx, and it came out really pretty. I just repeated the same three rows over and over. 2 cakes totsl. Thank you for my new to to pattern for quick shawls! I’m so glad you liked it Jessica! Please feel free to share your photo on the Moogly Facebook page! The Red Heart yarn had joins in inconvenient spots. Because I had to cut and retie, I do not have enough yarn to complete the project. I just finished row 20 and I do not have enough yarn left to SC around. I would suggest that people buy three skeins of same dye lot. I purchased the last four skeins of the dye lot to make two shawls. Can’t get any more. 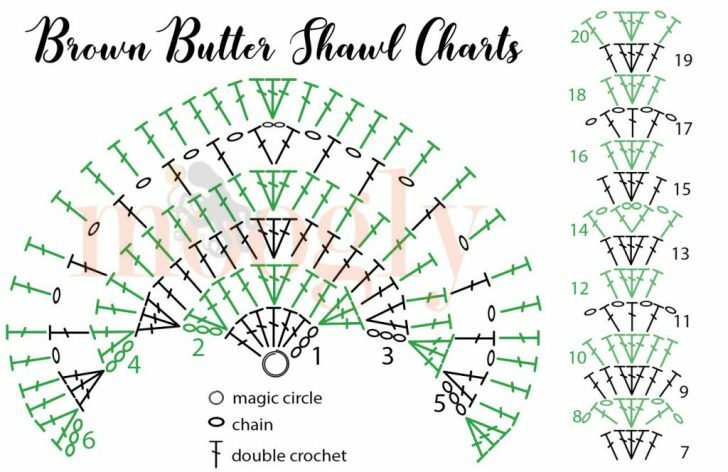 I want to continue the pattern beyond the 20 rows, but I’m a bit confused about the very middle and how to continue those stitches beyond the 20th row with regard to chain spaces versus just three double crochet in the center stitch. Enjoyed the video. It was very easy to follow. Thank you for sharing!!! Brown butter shawl!!! How large is the shawl as written?